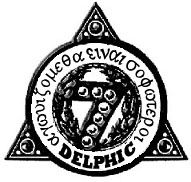 The Delphic Fraternity was originally founded as the Delphic Society in 1871 at the Geneseo Normal School in upstate New York (today SUNY Geneseo.) The aim of the society was to "provide a means for more extended cultivation in thought and language, for social advancement and promotion of good fellowship." The Delphic Society of Geneseo was a successor organization to the Delphic Society of Rochester, which was founded in 1850. The Delphic Society at Geneseo eventually became the Delphic Fraternity. The Delphic Fraternity is one of the oldest existing social fraternities in North America. According to Wikipedia's list of social fraternities, Delphic is the 31st oldest existing social fraternity in the U.S.A.
During the early 1900s, Delphic expanded to eight legendary chapters throughout New York and Pennsylvania. The Delphic chapter at the Cortland Normal School in NY (today SUNY Cortland) can trace its history to the formation of the Young Men's Debating Club in 1847. If the 1847 organizational founding date is considered, the fraternity would be the 16th oldest in the country. Organizationally, the Delphic Fraternity represents more than 170 years of history. The Delphic aims, circa 1922, were "to create an interest in good literature; to strengthen moral character; and to promote social welfare through the true spirit of brotherhood." By the late 1930s only one of the original eight chapters remained officially active: the distinguished Zeta chapter at the New Paltz Normal School (today SUNY New Paltz,) the oldest fraternity at New Paltz tracing its history back to 1889. In the early 1950s the New Paltz chapter was briefly associated with the national organization of Sigma Tau Gamma. In 1962 the Delphic Fraternity at New Paltz was incorporated in the state of New York. In 1987, after about 15 years of dormancy, the Zeta chapter at SUNY New Paltz was re-established as Delphic of Gamma Sigma Tau Fraternity. It is the second fraternity in the nation to officially promote multicultural diversity within collegiate institutions and the first truly multicultural fraternity to be formed on the East Coast. This organization honorably pursues the sustained dignity, equality, and unity amonGST all races and creeds. The Theta chapter of Delphic was formed at Binghamton University in 2003. The Kappa chapter of the fraternity was formed in 2009 at the University of Virginia in Charlottesville, VA. The Tau Alpha graduate chapter in New York City and the Tau Beta graduate chapter in Washington, D.C. were formed in 2014. In 2016, two undergraduate associate chapters were formed at SUNY Delhi and Lincoln University in Pennsylvania. "The few, the proud... Delphic." For an in-dept understanding of the history of the Delphic Fraternity, download a copy of the history e-book here. 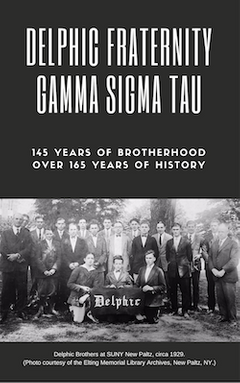 Delphic of Gamma Sigma Tau Fraternity, originally founded in 1871, re-established in 1987. You can download a copy of the fraternity history e-book by clicking here.